Kim Dotcom's Mega has been marching on into the future, so far without any sort of considerable pestering from one pesky United States government. In the meantime, Dotcom's been doing his best to beef the service up, offering cash money to anyone who can strengthen its encryption. And now Mega is taking Bitcoin. Because of course. At the moment—and for the foreseeable future—you don't buy anything directly from Mega. Instead, you buy it from one of many retailers. 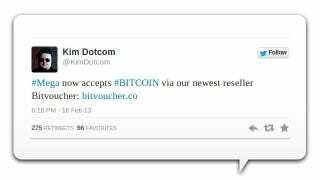 The newest of these, bitvoucher.co, just happens to take Bitcoins. Users flush with coin can now spend it on additional storage and bandwidth for prices of five to 16 bitcoin a year, or .5 to 1.5 bitcoin on a monthly payment schedule.